The world top of three-cushion, invited by Diane Wild in Lausanne, is preparing for a few nice and hectic weeks at the billiards. 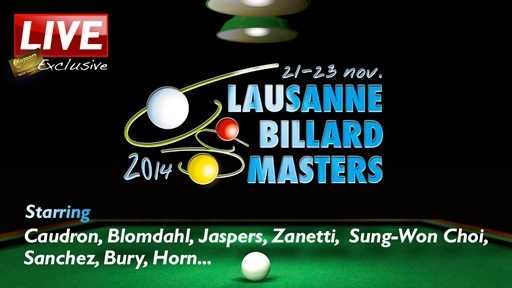 The end of the year is larded with some absolute top tournaments, with the Lausanne Billard Masters (21 to 23 November) as the first encounter. The top twelve of the world, with Fr�d�ric Caudron, Torbj�rn Blomdahl, thingy Jaspers, Sung Won Choi and Marco Zanetti are the spear points to enter the Casino de Montbenon to compete for the great trophy that Zanetti added to his palmares last year. Kozoom starts off the engines this week for a marathon of tournaments and competitions to finish the year of 2014. We invite all of you from 21 to 23 November, to watch the live images of Diane Wild's star ensemble, preparing for the World championship three cushion, one week later in South Korea.. If you don't have your Premium Pass yet, order it here. 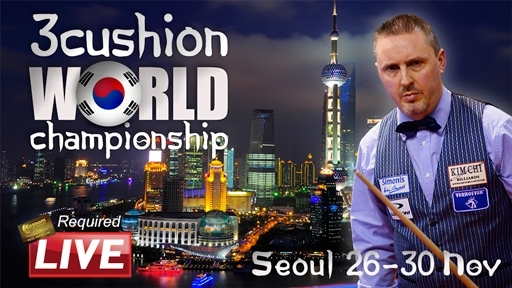 For the first time in the history of billiards, South Korea is hosting the World championship three cushion. The top of the world gathers at the Jamsil Stadium in Seoul from 26 to 30 November in the country where three-cushion in popularity has risen to great heights. The World Cups in South Korea have shown how intensely the Asians enjoy the game and how many players have made the step to the world top. Fr�d�ric Caudron returns to his second homeland to defend the world title, which he won last year in his own Belgium, in the Lottohal in Antwerp. Kozoom will closely follow the most important tournament of the year and forward all live images to the enthusiast viewers and lovers of three cushion. The World championship, which is held for the 67th time this year, has a long history with famous winners like Raymond Ceulemans, Nobuaki Kobayashi, Torbj�rn Blomdahl, D!ck Jaspers, Dani S�nchez, Marco Zanetti, Eddy Merckx and many other stars of three cushion. The Koreans are chasing for a first title with Sung Won Choi, Kyung-Roul Kim, Jae Ho Cho and other top players from the host country. Kozoom wishes you a wonderful World championship with lots of highlights and a worthy champion. GBE2015 - the 9th China Guangzhou International Billiards Exhibition will bounce back during May 9-11, 2015. This three day annual event will provide a big opportunity to the billiard Industries to jointly meet with each other, showcase their latest products, gather with the attendees and give them information on the future trends and valuable business tools for immediate positive impact on their business. 13,000 square meters, 180 exhibitors, 12,000 visitors from 40 countries and regions are waiting for your attention! Our regular exhibitors and international brands never miss the feast, included Shender, Yalin, Predator Group (USA), Lucasi Hybrid (USA), Billking Korea, Leo, Kanghom, Jianying, Sampro, Wiraka, Rasson, Fury Cues, Billplex Korea, PALKO PTY LTD (Australia), Iwan Simonis (Belgium), Hainsworth Cloth England, Strachan 6811TM (UK), Aramith Ball Belgium, Dynamic Billard Organisation GmbH(Germany), Master Cues, Mezz Cues, etc. Their participation further highlights GBE�s comprehensive influence. Billiard Distributor, Agent, Importer/Exporter, Sport Products Retailers, Amusement Center, Leisure Sites, Individual, Lovers, Billiards Club, etc. For attendees, the GBE show has become their one-stop sourcing platform that no one can afford to miss. Exhibitors at the annual GBE expo represent product lines in Billiards Tables, Billiards Board (stone), Billiards Cloth, Billiards Pole Bags, Billiards Baskets, Billiards Balls, Cues, Chalk, Lighting, Tripod, Special Gloves, Accessories, etc. GBE provides incomparable opportunities for home and overseas companies in this line to explore Chinese market, strengthen international market and establish strategic cooperation. Leaders in many sports have discovered first-hand the value that a well-run trade show can stimulate the development of the industry. Nowhere is this more evident than at the annual China Guangzhou Billiards Exhibition, which has grown over the last 9 years into one of the most important yearly events for organizers, suppliers and many event athletes in the billiards industry. Opportunity knocks but once! So come and join us. There are numerous business opportunities, as long as find, you are a winner. Many-time world champion Kelly Fisher is proud to announce that she has recently signed a new sponsorship deal with the Cyclop Ball Company. Cyclop, based out of Shanghai, China, has been making quite a splash in the pool world in the last two years, and the addition of the British great is aimed at taking the company to even higher levels. The Cyclop balls have been attracting attention due to their content of highly configured Phenolic resin, allowing for durability while keeping their shine and color longer than the standard pool balls. With their distinctive pastel colors mixed in with traditional colors, Cyclop balls have become the billiard ball of choice in tournaments around Asia, and are regularly being seen in tournaments the world over. Cyclop have recently signed a five year contract with the Chinese Billiard and Snooker Association, which means Cyclop will be the official balls used for all pool events from 2014-2019, including World Pool and Billiard Association(WPA) tournaments, held in China. Kamila Khodjaeva lost the final match of the WPA World 9-Ball Championships for Youth in Shanghai, China with 3:9 to Liu Yuchen (CHN) and won the Silver Medal in the girls division. The final score already indicates that Khodjaeva did not really get too many chances in the match. She tried to keep the match open as good as she could but Liu was simply too strong for her. Every mistake that Khodjaeva committed was punished without mercy by the Chinese. After six racks, the score was tied at 3:3 and Khodjaeva went for a time-out. She attempted to get her nerves together. When she came back, she missed an easy 6-ball and Liu ran the rack and the next one to get a two-point lead to 5:3. During that period of the match Khodjaeva suddenly lost all her self-confidence. Whatever she tried, the balls simply did not roll her way. Liu had a good roll and made use of it. She played good safety shots and did not leave any chance for Khodjaeva anymore. 9:3 was the final result for Liu which brought her the match and the Championship. In the Under 17�s, Kong De Jing (CHN) won by a whisker with 8:7 over Jeffrey Roda (PHI). In the Under 19�s division, Aloysius Yapp (SIN) took on Hsu Jui An (TPE). Hsu was painfully remembered by the European team since he had ousted several team members from the event. He started as usual and took a quick 4:0 lead over Yapp. But the player from Singapore found his rhythm during the match and puled back rack after rack, bringing the score to 10:10. The match had a thrilling end which saw Yapp as a winner with 11:10. 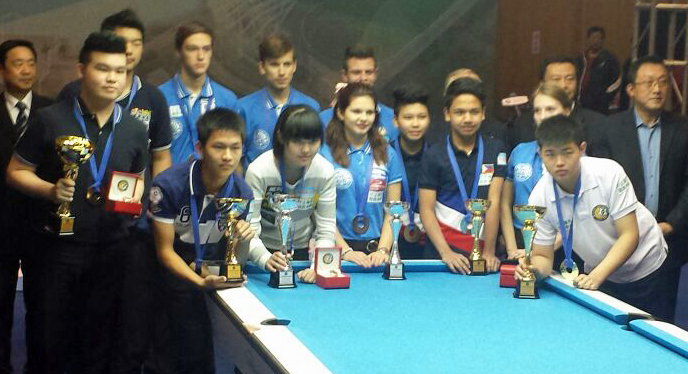 In summary, the Asians have again dominated this year�s World Championships Youth. Team Europe was prepared well but Lady Luck was not on their side. Maybe things will turn out better next year when the event will once again be held in China. Shaun Murphy won the Kreative Dental Ruhr Open in Germany, making a maximum break in a 4-0 victory over Robert Milkins in the final. Murphy made it back-to-back European Tour titles having won last month�s Bulgarian Open and the world number seven has now won four titles in 2014. The highlight of his emphatic final win over Milkins in Mulheim came in the second frame as he potted 15 reds with blacks and cleared the colour to score the 108th maximum break in snooker history. It was the fourth 147 of Murphy�s career and third of 2014. He becomes the first player to make three maximums in a calendar year, having made one at the Championship League in January and another at the Gdynia Open in February. Amazingly, Murphy had missed two golden chances of 147s earlier in the day, getting as far as the colours both times but missing the blue in his last 16 match against Joe Swail and the green in his quarter-final against Mark Williams. Manchester-based 32-year Murphy collected 25,000 Euros for winning the tournament, plus a �1,000 bonus for the maximum. He also compiled breaks of 66, 62 and 58 in a one-sided final against Gloucester�s Milkins, who had hoped to win a tournament carrying ranking points for the first time in his 19-year career. Former World Champion Murphy, who goes into next week�s Coral UK Championship in peak form, said: �I had four or five chances at maximums before the final. When I got the chance tonight I was under so much pressure. 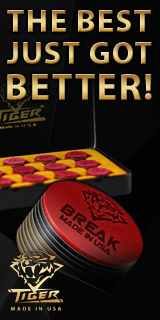 I potted a very difficult 15th black and finished perfect on the yellow, then I was just concentrating on every ball. "When I started working with my coach Chris Henry we focussed on making 147s because top players make them all the time but I wasn't doing that. Now the work I've done is coming through. "I had a few barren years where I started to lose a bit of faith in my game. I was looking for answers elsewhere and I even thought about jacking it in. I'm really pleased that I stuck with it and got through that bad patch, and I'm so happy to have won another trophy. "We all came here to prepare for the UK Championship and I can't wait to get stuck in next week." Earlier in the semi-finals, Murphy came from 3-0 down to beat Judd Trump 4-3 while Milkins saw off Stephen Maguire 4-1. The 2014/15 European Tour series comprises six events across the continent, with the top 24 in the final Order or Merit to go through to the Players Championship next March to battle for the �100,000 jackpot. The next event is the Lisbon Open in Portugal from December 11 to 14. The Inaugural Women's International Pool Championship Announced! New York City, New York- The pool world is in for another fantastic event with the all new inaugural Women's International Pool Championship! Dragon Promotions is bringing big time, world class women's pool back to the United States with this new event that is also featuring qualifiers all over North America. The event takes place December 16-21, 2014 featuring 64 elite women from around the world and hosted by Steinway Billiards Cafe in New York City, the epicenter of American culture. All players may participate without penalty per latest email confirmation from WPA President Ian Anderson, and all WPA issues with the event have been resolved. The event is sanctioned by the WPBA. From Seattle to Quebec, and Tampa to New York City, there will be a multitude of opportunities for players to qualify. The ones who do win will get to play a guaranteed 7 matches in the round robin! Not bad for a $50 entry fee and taking a crack at the $14,000 1st place prize. 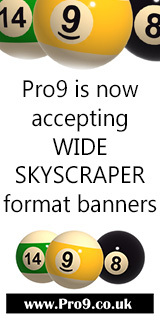 A very big opportunity for up and comers looking to gain experience on the women's pro tour scene. The Women's International Pool Championship format will be very challenging. It begins with an 8 women round robin with every player playing a guaranteed 7 matches. The field is cut in half and then moves onto the knockout rounds in a race to 10. The quarter-finals goes to a race to 11, and then the semi-finals race to 13. The Pool Championship Finals will be a race to 17. The eventual tournament winner will have played 12 world class opponents. 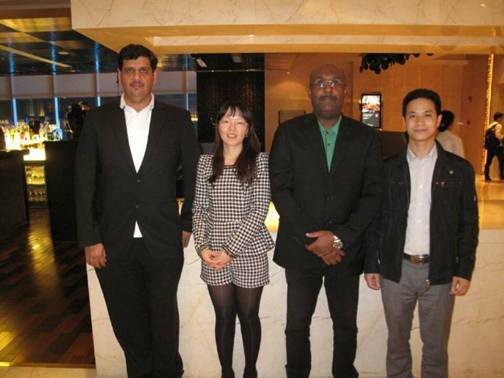 Salem, General secretary of Qatar Billiard & Snooker Federation (QBSF)&president of W9BC and Mubarak, president of Asian Confederation of Billiard Sports (ACBS), met with Levi Wang, general manager of Guangdong Grandeur International Exhibition Group and Eva Deng, international department manager at 21:30 p.m. of Nov.13. at Marriott Hotel. The two sides reached a consensus of collaboration. The journey of Salem and Mubarak in China was fairly tight, and this meeting was made in spite of their busy schedule, which their working aspiration was really impressing. With the ardent invitation of organizing committee, ACBS and QBSF were willing to be the co-organizer of GBE to host the global billiards event together. Meanwhile, Salem and Mubarak were agreed to be the overseas adviser of GBE and promised to publicizing GBE in relevant international platform and inviting business people in Asia and Middle East to participate. QBSF and W9BC will be an exhibitor of GBE2015, which is a major theme of the journey of Mubarak and Salem . W9BC will open to Chinese sponsors, which offers an excellent opportunity for Chinese brand to go out. They took a particular on eye programs of QBSF booth design and construction, and visitors in GBE 2015 will certainly enjoy the wonderful presence of it on the spot. Mubarak gave enormous affirmation to the efforts of organizing committee in the conversation. When mentioned the issue of billiard back to Asia Games, he said that he and the association will do their utmost efforts to make it come true, for it will make great influence to billiard industry in Asia . GBE wishes the dream of billiard return come true as soon as possible. As the most influential industry event, GBE never failed our trust of exhibitors, purchasers and worldwide supporters. We never stop fighting! The 9th Guangzhou International Billiard Exhibition will be held in The Import and Export Fair Pazhou Complex during May 9th to 11th, 2015. See you there! Edison, New Jersey � Sunday November 23, 2014 marked the day that several cue toting women would come out to Sandcastle Billiards from various states ranging from Maryland, New York, Pennsylvania and even as far as Virginia to compete in an attempt to qualify for a spot in the largest and most prestigious women�s event being held in the United States, the inaugural Andy Cloth Women's International Pool Championship !
" J.Pechauer Cues is thrilled to be joining Dragon Promotions in putting a major championship on US soil. The Andy Cloth Women's International Pool Championship has created so much buzz already, and it's only going to get better. These kind of activities really help boost billiards, and we need to get people excited again", said Joe Pechauer, President of J.Pechauer Cues. While J.Pechauer Cues can meet nearly every price point of any customer or mass market, Pechauer Cues made it's name through custom cue making and till this day it remains a core part of their business. In the Sandcastle qualifier, what would typically be the �hot seat� match in a double elimination tournament was actually a match for the first of two qualifier slots being awarded out. This brought two thus far undefeated ladies to the table. Caroline Pao and Jai Li would face off for the first slot. Caroline showed her true speed and tenacity at the table as she jumped out to a 5 game lead in the race to 6. As Caroline sat comfortably on the hill, Jia would put two games up on her side of the score beads before Caroline closed out the set at 6-2 and claimed the first spot! Jia would be sent west to await her next worthy competitor and a second chance to earn a spot into the Women�s International Pool Championships. Already happening on the west side of the charts, the ladies were battling for survival. other of the 2 slots being awarded into the main event. 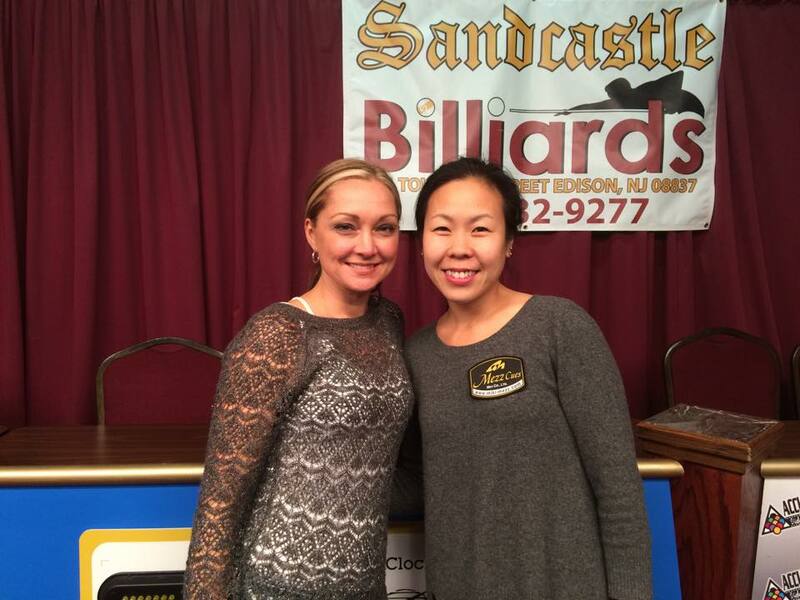 A very well deserved congratulations goes out to Caroline Pao of New Jersey and Dawn Fox of Pennsylvania as we wish them luck and good shooting in the inaugural Women�s International Pool Championships next month. Thank you to all the ladies that came out to compete on Sunday. We wish you luck in the future qualifiers and perhaps we�ll see you after all in New York! From Seattle to Quebec, and Tampa to New York City, there was a multitude of opportunities for players to qualify. The ones who won will get to play a guaranteed 7 matches in the round robin! Not bad for a $50 entry fee and taking a crack at the $14,000 1st place prize. A very big opportunity for up and comers looking to gain experience on the women's pro tour scene. Main event Dec 16-21, 2014 in New York City at Steinway Cafe-Billiards. Special PPV Pro Event Invitational on Dec 14th. World Snooker�s European Tour series will be sponsored by Kreativ Dental, world leaders in dental tourism, next season thanks to a new wide-reaching agreement. The 2015/16 Kreativ Dental European Tour will comprise six events across the continent, helping snooker to grow in new territories. Based in the Hungarian capital of Budapest, Kreativ Dental is one of Europe's leading dental centres and attracts customers from around the world. As part of the agreement, Kreativ Dental will also be a partner of the last two events of the current series: ET 5 - The Lisbon Open in Portugal in December and ET6 The Gdynia Open in Poland in February. World Snooker Chairman Barry Hearn said: �We are delighted to welcome Kreativ Dental as the overall sponsor of the 2015/16 series. They have become involved with snooker in recent months and it�s easy to see why. The European Tour receives tremendous coverage from Eurosport, with nearly 400 hours of broadcast and over 120 million viewers in 68 countries, so the opportunities for brand exposure are vast. �This series has been hugely successful in terms of taking snooker to countries such as Bulgaria, Latvia, Portugal and Poland for the first time. Alongside our partners we will continue to develop these new markets and enhance our sport�s international growth. The European Tour has seen tournaments staged in 11 different countries around the continent, contested by top stars such as Ronnie O�Sullivan, Judd Trump, Neil Robertson, Mark Selby and Shaun Murphy, as well as the leading local amateurs. Each year the leading players on the Order of Merit qualify for the Players Championship Grand Finals. The Order of Merit will now be known as the Kreativ Dental European Tour Order of Merit. After his incredible victory in Sunday's UK Championship final, Ronnie O'Sullivan is now looking ahead to the defence of his Dafabet Masters title next month. The Rocket beat Judd Trump 10-9 in one of snooker's all-time classic matches to win his fifth UK title and 15th Triple Crown event in all. He also made a stunning 147 maximum break during the tournament in York. And fans will have another chance to see O'Sullivan at Alexandra Palace in London next month, with snooker's most prestigious invitation event running from January 11 to 18. O'Sullivan plays his first match on Tuesday January 13th at 1pm against Ricky Walden. Last year he met Walden in the quarter-finals and scored a record 556 unanswered points, before going on to beat Mark Selby 10-4 in the final to take the trophy and �200,000 top prize. 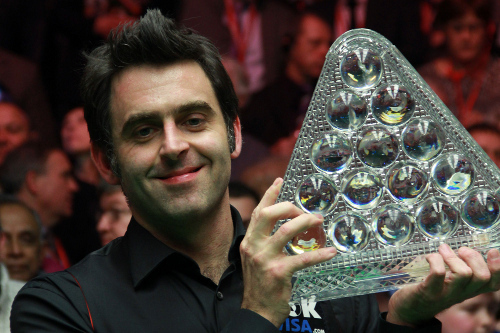 O'Sullivan revealed that the challenge of snooker's next generation of players has forced him to adapt. "I've had to reinvent my game in many ways to compete in the new era of snooker," said the 39-year-old. "I felt that I wasn't a powerful enough player. I had to change my technique in order to allow me to play certain shots which the modern player can. I watched what they do and how they do it, and realised I need to learn from them. "Players like Judd Trump, Mark Selby, Neil Robertson and Ding Junhui, once they get confidence they can dominate the table. They play a very attacking and very aggressive game. I can see Judd being the leading player in years to come, although the others are very tough competitors. "I don't want to stop now because I'm enjoying it, but I don't want another match like that final against Judd because it took a lot out of me. It has been a fantastic calendar year for me and a great start to this season. I can't wait for the Masters now." Only last month, after losing his opening match at the Champion of Champions event against Judd Trump, Glasgow's Maguire admitted he was thinking of quitting snooker. Since then he has reached at least the semi-finals of three consecutive events, and he has now won a tournament which counts towards the world rankings for the first time since the 2013 Welsh Open. With victory over Selt - who was playing in his first professional final - world number 12 Maguire took the 25,000 Euro top prize at the season's penultimate Kreativ Dental European Tour event. "Apart from my first match and the final which were a bit scrappy, I played well over the two days," said 33-year-old Maguire. "I won't get carried away with this and it still hurts that I lost to Judd in the semis of the UK Championship last week. But it feels good to lift a trophy again and to be the last man standing. I'll have a break over Christmas and hopefully win more next year." The first ever professional tournament in Portugal was enthusiastically received by the local community, with fans flocking to the Casal Vistoso Sports Centre in Lisbon to watch many of the world's best players. Maguire added: "I didn't expect to see big crowds here, but the fans were great - they made the tournament." The other highlight of the tournament was a 147 from Ben Woollaston - the first maximum of his career - on Friday. The 2014/15 Kreativ Dental European Tour series comprises six events across the continent, with the top 24 in the final Order or Merit to go through to the Players Championship next March to battle for the �100,000 jackpot. Eurosport has unveiled its �10 Future Stars for 2015�, with emerging names from the worlds of athletics, tennis, cycling, football, motorcycling, skiing and swimming among those tipped for major career breakthroughs in the New Year. The global sports broadcaster�s expert producers and commentators established an impressive track record with their inaugural 2014 �Future Stars� selection that included Grand Slam tennis finalist and year-ending # 3 ranked player, Simona Halep and Masters golf runner-up Jordan Spieth who are now household names after a game-changing year. The selections were made by a panel of Eurosport�s producers and commentators from across Europe, drawing on years of experience across the broadcaster�s core sports. They were Stefano Bernabino, Christophe Bureau, David Hendon, Tim Hutchings, Alexandre Pasteur, Simon Reed, Marcos Robledo, Fran�ois Schlotterer, Sebastian Tiffert and R�my Tissier. �It is very rewarding that so many of the athletes we selected for 2014�s �Future Stars� enjoyed such a successful year. Our editorial team can take a lot of pride from this and it clearly demonstrates the quality of their knowledge across international sport,� said G�raldine Fliliol, Eurosport�s Deputy Managing Director for International Communications, Marketing and External Relations. �2015 is truly a year of champions on Eurosport with 37 World Championships being broadcast on our channels alone. So I am sure our viewers will be seeing some of the �2015 Future Stars� on the podium in the coming year as part of Eurosport�s live coverage,� Filiol added. Athletics commentator Tim Hutchings reckons 17-year-old heptathlete Morgan Lake is the latest in �Britain�s production line of astonishingly talented multi-event females� following the likes of Denise Lewis, Jessica Ennis and Katarina Johnson-Thompson. The �powerful� Londoner became the youngest ever heptathlon winner and also won gold in the high jump at last summer�s IAAF World Junior Championships. Briton Oliver Lines, 19, caused shockwaves earlier this year when, in his first season as a professional, he beat snooker�s world champion Mark Selby in the International Championship and reached the final of the Asian Tour�s Haining Open. �He could really make a name for himself and he seems to have his feet on the ground,� snooker commentator David Hendon said. Page took 0.066633 seconds to load.